Two companions waiting to cross a street in Paris. As many of our loyal fans would know, The Pop Culture Historian tends to review movies that deviate from the mainstream, such as the short film Retribution or the B-movie Deadly Prey, or even the Asian gem Chungking Express. Now we review the French short film The Red Balloon (Le Ballon Rouge). 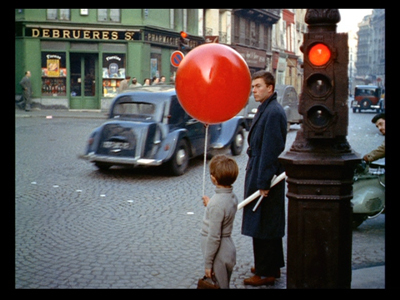 Albert Lamorisse’s The Red Balloon tells the story of a boy (Lamorisse’s son Pascal) and an apparently sentient red balloon that he happens to find tied to a streetlight on the way to school one day. It’s impossible to really describe the plot beyond that as there really was none. Many French movies from the post-World War II era showed a preference of seemingly letting events simply unfold rather than constraining their characters to a plot; a good example of this is the 1976 slice-of-life comedy Small Change, which had even less plot than The Red Balloon did. The Red Balloon simply showed the relationship between the lead character and his balloon. Hardly any dialogue was spoken throughout the movie’s 34-minute length, basically demonstrating Lamorisse’s ability to show without telling. The balloon appears to follow the boy without him holding it. When the boy’s mother leaves the balloon outside their apartment’s window, the balloon simply stays there until the boy can collect it again. When a man locks the boy up in a room, the balloon follows and pesters the man until the man lets the boy back out. It doesn’t take long before the balloon becomes the object of desire for other boys. The only word I can really think to describe The Red Balloon is “poignant”. Lamorisse appeared to recognize that there is such thing as too much when making a movie, and basically just put in the bare essentials while allowing a lot to be left to the viewer’s imagination. While many modern viewers might simply write The Red Balloon off as fodder for the overzealous film scholar, I think it’s a great one to pick up for those who don’t really mind having to think a bit about their movies.